a Transmission Line is any thing used to transmit a electric signal. in a AC circuit, the voltage does not only variate on time but also on space. For low frequency, the wavelength is long and this can be neglected. But at hight frequency, the variation is significant. since the voltage is changing from different location. we cut the transmission line in a small sector, and each sector is analog to some circuit elements, no matter the shape of the line. this gives us a easy understanding of what is going on for the voltage and current. But this analogy neglected the effect of temperature, material non-linearity and magnetic hysteresis effect. since the resistance and inductance have unit per length. rearrange and take limit of x.
and the current share the same equation. notice that k is a complex number. where the subscript means forward and backward. from the coupled equation of Current, we can related the voltage and current and find out the impedance. Thus, we define the Characteristic Impedance for forward wave. the Characteristic Impedance for backward wave is a minus sign. there fore, we can rewrite the current in term of voltage. 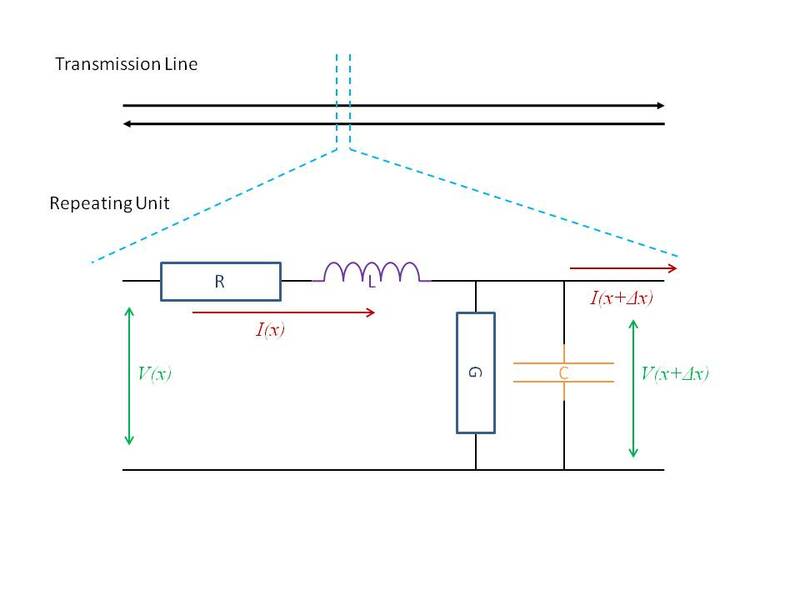 for no reflected wave, the impedance of the load and the transmission line should be equal and it is called impedance matching. when the impedance is matched, the power is maximum.